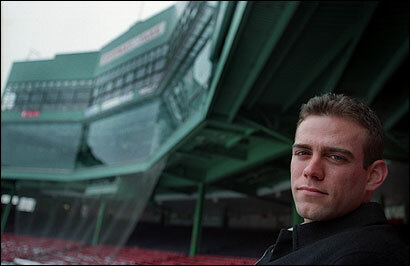 Theo Epstein, the Brookline native who in 2002 became baseball's youngest general manager, and in 2004 became the youngest to win a World Series, announced last night that he was leaving the Red Sox, hours before his contract was due to expire. While the initial differences in Epstein's negotiations centered on money, those issues were bridged, to the point that multiple major league sources said over the weekend that Epstein and the club had come to an agreement on an extension. However, issues of respect and control between Epstein and CEO/president Larry Lucchino could not be overcome, ultimately leading Epstein, 31, to reject the club's three-year, $4.5 million offer and give up what might well have been the only job he ever wanted. Standing inside Fenway Park at 7 last night, the 11th general manager in the team's 105-year history contended that at no point had he agreed to a deal. He declined further comment, asking that a statement he issued through the team speak for itself until today, when he is expected to break his silence. ''He told me he had to clear his desk, that it was very emotional, that he had to leave the team," said former Tigers GM Bill Lajoie, Epstein's 71-year-old special assistant. ''He said he didn't have any plans but that he had to get away from the team." Lajoie, one of Epstein's top advisers, resigned within minutes of Epstein doing so. It's possible that other baseball operations employees will also exit, especially given that assistant GM Josh Byrnes left to become the GM in Arizona last week and will be assembling a staff. ''I felt loyalty to my boss and left also," Lajoie said. ''Certainly I was surprised," James said. ''I love the Red Sox and have no plans to look for a new paramour." Epstein, who brought the team to unprecedented heights -- three consecutive seasons of at least 95 wins, and three consecutive postseason appearances -- is believed to have made just $350,000 this past season, positioning him near the bottom of the league's general manager pay scale. During recent negotiations, Epstein received offers of $850,000 per year, $1.2 million per year, and then $1.5 million per year. However, when the time came to decide, Epstein realized that money was not reason enough to stay. In his statement, Epstein called the decision to leave ''an extremely difficult one," and said he ''will always cherish the relationships I developed here. ''In my time as general manager, I gave my entire heart and soul to the organization," said Epstein, who grew up on Parkman Street in Brookline and attended Brookline High. ''During the process leading up to today's decision, I came to the conclusion that I can no longer do so. In the end, my choice is the right one not only for me but for the Red Sox. ''My affection for the Red Sox did not begin four years ago when I started working here, and it does not end today." Epstein said he will remain on the job for ''several days," in preparation for baseball's general managers' meetings, which begin Monday. ''Thereafter," he said, ''I will make myself available to the organization to ensure a smooth and stable transition." He leaves a team in transition, a team that must decide whether to accommodate Manny Ramirez's trade request, how to improve its pitching staff, and whether to re-sign center fielder Johnny Damon and other free agents. But first the team must hire a general manager, and David Ortiz wondered who will want to work under Lucchino's heavy hand. ''Who is the GM going to be?" Ortiz asked. ''And who is going to want to become GM of our team to work for somebody else? A GM wants to be somebody in a position [of power]. If you're going to be the GM, just to get orders from someone else, it's something they aren't really comfortable with. ''We need Theo. Hopefully, they put it together to keep Theo. ''He came up with some good ideas that did nothing but help this ball club, this team. ''Before, from what I hear, they had good players, but they never had that chemistry. That's what the team is based on. Who brings the mentality to play the game every day? He understands that." Epstein also understood a need to address the team's age. During these contract negotiations, Epstein presented a need for the team to get younger, and to give talented prospects in his burgeoning farm system a chance to prove themselves, even if it cost the club wins in the short term. Privately, he feared he'd be pressured internally to acquire pricier free agent talent. Epstein, in cutting ties with the club, leaves behind the people who taught him the inner workings of the game. In 1992, he was hired as an intern by Orioles PR director Charles Steinberg, now the Sox' executive vice president for public affairs. Steinberg brought Epstein to the attention of the Orioles CEO, Lucchino. Epstein, during this past season, occasionally hinted at not returning to the club, though he always followed such hints with a smile, making the threat seem baseless. However, he frequently struggled with the celebrity status he was assigned in the city. He was never comfortable with it, and didn't find it healthy. ''I respect his decision," said manager Terry Francona, who received calls from Epstein and Lucchino explaining what had happened. ''I just wish he wasn't leaving. Things like this you take for granted sometimes. I felt like I was going to be with this guy for a while. Maybe we weren't together 24 hours a day, but it was 18. We've been through a lot." Despite growing up in Fenway's shadow, Epstein severed his emotional ties to the club, operating as a keen businessman, which was never more evident than on July 31, 2004, when he dealt iconic shortstop Garciaparra to the Cubs, for shortstop Orlando Cabrera and first baseman Doug Mientkiewicz. He did so with ''mixed emotions," he said that day, calling Garciaparra ''one of the greatest Red Sox of all time." But, Epstein added that day, ''We've made our club more functional. We weren't going to win a World Series with our defense." With those defensive upgrades, and gutsy pitching performances -- especially by Curt Schilling and Keith Foulke -- the Sox did win the World Series. Epstein, 11 months earlier, had journeyed to Arizona for Thanksgiving at the Schillings' house, where he and an assistant, Jed Hoyer, talked Schilling into coming to Boston. Schilling, traumatized ankle and all, won Game 6 of the American League Championship Series and Game 2 of the World Series. ''You don't get better losing a guy like Theo," Schilling told the Associated Press. ''It's obviously going to be an incredibly unpopular decision with the players." But one of Epstein's most enduring moves attracted far less publicity than the acquisitions of Foulke or Schilling, and that was the signing of Ortiz in January 2003. ''He has a very high ceiling," Epstein said that day. ''You're looking at a player with the potential to be a middle-of-the-lineup bat in the big leagues." ''Crazy," Ortiz said when asked to talk about Epstein's departure. ''It's crazy. Theo was great. People love Theo. How long was Theo in the Red Sox organization for before he won a World Series?" ''We were in the playoffs every year," Ortiz said. ''He put the pieces together. They should iron things out with Theo. He's the man, bro." That was an opinion shared by many in Boston. Epstein, though, has long considered his twin brother, Paul, a social worker, the real success in the family. The day Epstein was announced as GM his dad, Leslie, said, ''Whatever Theo accomplishes, even if that includes winning the World Series, cannot equal what Paul already has accomplished. He has saved lives." ''He was a pretty significant part of my life," Francona said. ''I have a lot of admiration and respect of him. It's different. Change is so unsettling anyway, more so when it's someone very close to you. I mean, this guy impacted my life." There are general manager openings in Philadelphia, Los Angeles, and Tampa Bay, but it's unclear when and if Epstein will return to baseball. ''My passion for and dedication to the game of baseball remain strong," Epstein said in his statement. ''Although I have no immediate plans, I will embrace this change in my life and look forward with excitement to the future."